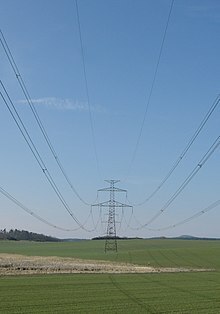 In physics and electrical engineering, a conductor is an object or type of material that allows the flow of charge (electrical current) in one or more directions. Materials made of metal are common electrical conductors. Electrical current is generated by the flow of negatively charged electrons, positively charged holes, and positive or negative ions in some cases. In order for current to flow, it is not necessary for one charged particle to travel from the machine producing the current to that consuming it. Instead, the charged particle simply needs to nudge its neighbor a finite amount who will nudge its neighbor and on and on until a particle is nudged into the consumer, thus powering the machine. Essentially what is occurring is a long chain of momentum transfer between mobile charge carriers; the Drude model of conduction describes this process more rigorously. This momentum transfer model makes metal an ideal choice for a conductor as metals, characteristically, possess a delocalized sea of electrons which gives the electrons enough mobility to collide and thus effect a momentum transfer.
. Resistivity is a measure of the material's ability to oppose electric current. 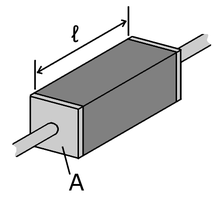 ^ a b "Wire Sizes and Resistance" (PDF). Retrieved 2018-01-14. ^ "High conductivity coppers (electrical)". Copper Development Association (U.K.). Archived from the original on 2013-07-20. Retrieved 2013-06-01.